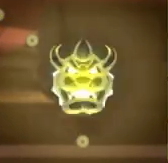 Bowser Stunners are a special type of Amp that first appear in New Super Mario Bros. U. They return in New Super Luigi U and New Super Mario Bros. U Deluxe. As their name implies, these Amps resemble Bowser's head. In New Super Mario Bros. U, Bowser Stunners make their only appearance in Red-Hot Elevator Ride as obstacles, where they electrocute the player upon contact. Unlike common Amps, Bowser Stunners have special chains connected to another Bowser Stunner, creating a stream of electricity to travel on the chains. The Bowser Stunners reappear in New Super Luigi U, and act the same as they did in New Super Mario Bros U. They appear in the Peach's Castle level Current Event where they are a major obstacle. ↑ Stratton, Steve (November 18, 2012). New Super Mario Bros. U: Prima Official Game Guide, page 199. ↑ Shogakukan. 2015. Super Mario Bros. Hyakka: Nintendo Kōshiki Guidebook, New Super Mario Bros. U section, page 215. This page was last edited on February 3, 2019, at 01:14.